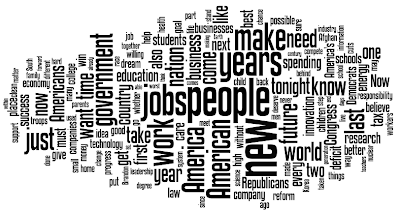 What you say and what people remember can differ. 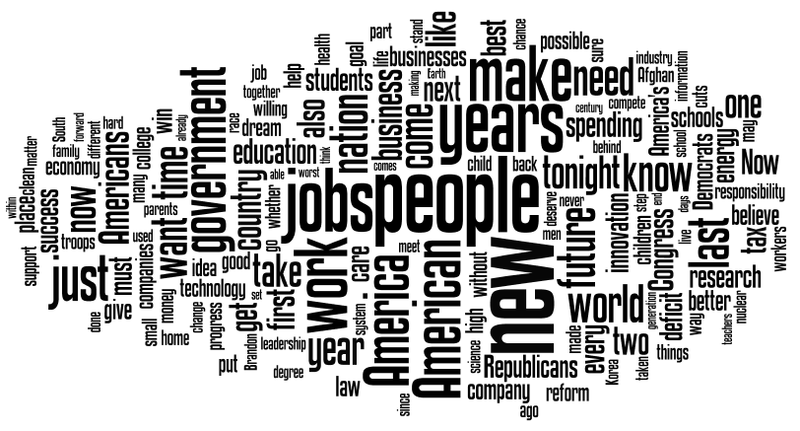 I did not watch this particular speech as it aired. But this pattern so striking that I decided to go back and watch the thing to try to figure out what the heck was accounting for this difference. Besides, I had decided to pull an all-nighter anyway, because I had a ridiculously early wake-up time for a trip. So I had time to kill, and I listened. I was expecting the salmon reference to come at the very beginning or near the end, because of the primacy and recency effects in memory. I was surprised to see it fairly solidly in the middle of the talk. I do think that the reason education looms large as the largest specific topic (rather than general impressions like “hopeful”) is that it was at the beginning of the talk. That this example stuck is a great testament to the power of humour. 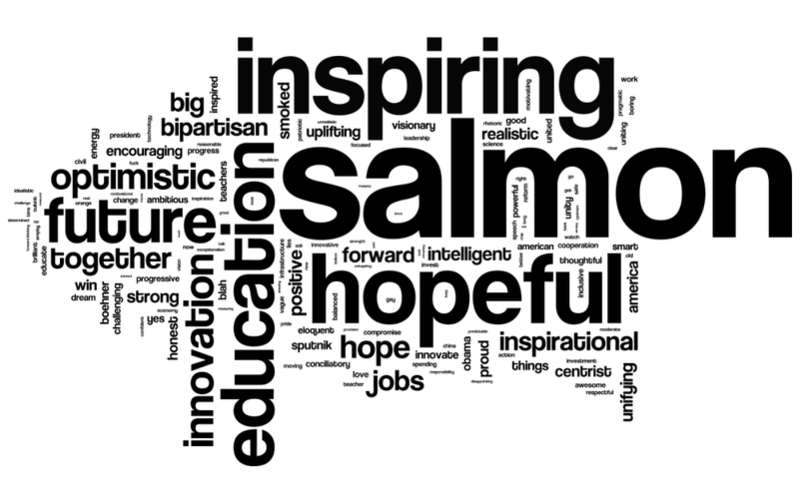 The word “salmon” appears exactly once in the entire speech. Teachers who have to do a lot of lectures may find that their students might not remember the thing they were supposed to learn, but they will remember the jokes. But why that one? It certainly wasn’t the only joke in the speech. The transcript indicates “(Laughter. )” at least five other times. For some trips, it will be faster than flying – without the pat-down. One caveat on using humour during a presentation. Don’t just tell a joke just to make a joke. Tell a joke to make a point. The humour should relate to the material. While I smiled more at the pat-down line, it wasn’t making a point about high-speed rail; more a passing reference to the inconvenience of air travel. 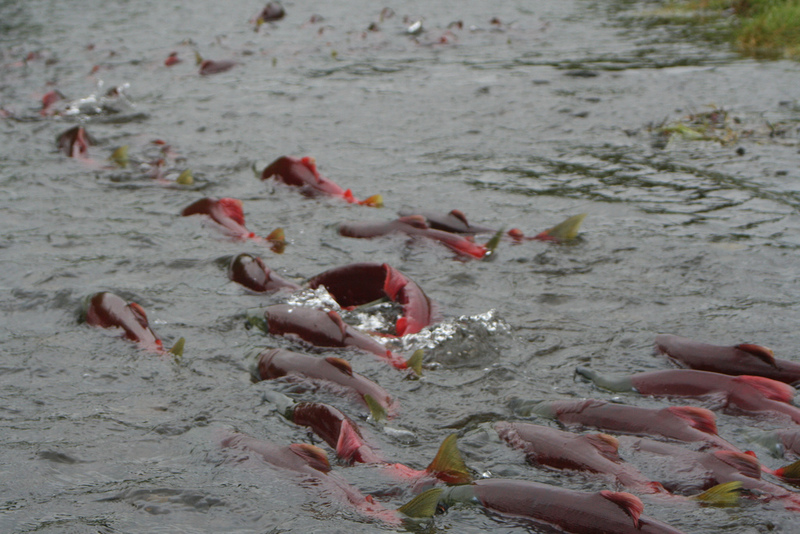 The whole anecdote about salmon exemplified the bigger issue about bureaucratic structure. The moral of the story is to make sure your humour serves your main point. Humour is so powerful, so memorable, it can detract from your main point rather than enhancing it if you’re not careful. I guess it was too much to hope that the U.S. President gave a speech all about how the future of American was ichthyology. Ballade – it’s like a ballad. Only classier. Elissa Malcohn, writing at Chronicles from Hurricane Country, has a poem inspired by my post on scanning the brains of salmon as they smelled water from the stream they were hatched in. It’s called “Scent and sensibility,” and you can read it here. This isn’t the first time I’ve had something I’ve written inspire poetry. After I wrote an article in The Skeptical Inquirer on the possibility of extraterrestrial intelligence, I received a poem called “Digging graves” in the post. 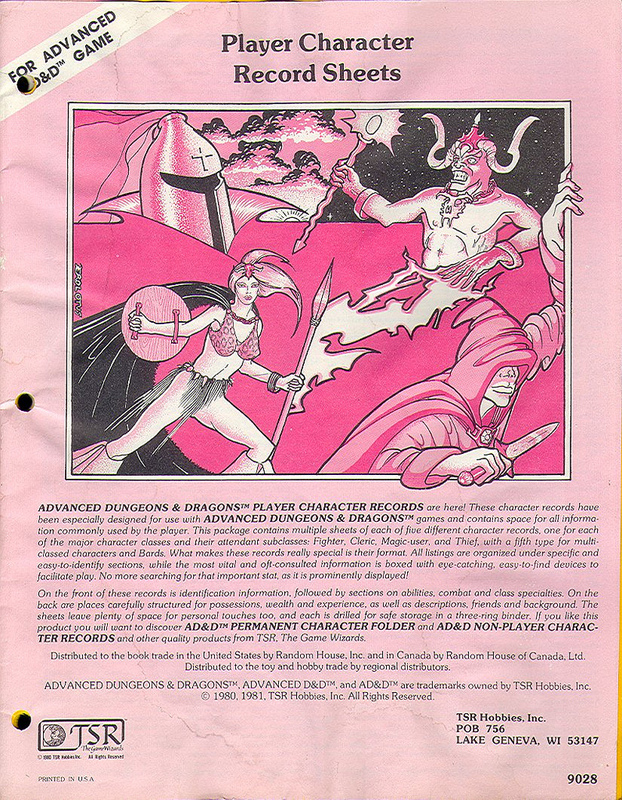 I probably still have it in storage somewhere. Thursday, 27 January, 3:13 am. 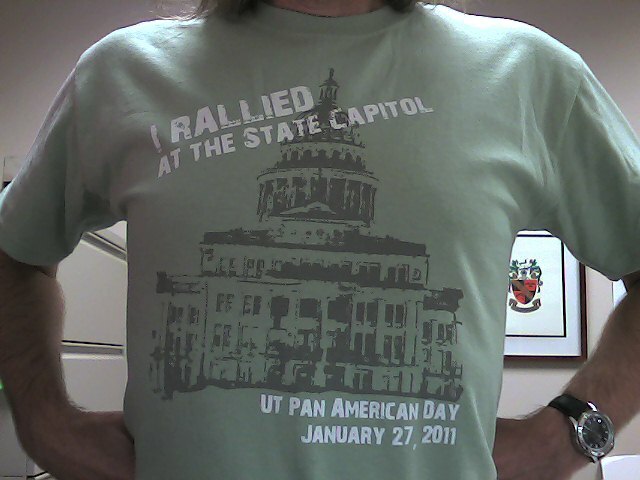 A week or two back, an email went around about my institution hosting “UTPA Day” at the state capital in Austin. The idea is to go and inform the legislators about who we are and just what it is that we do, as south Texas traditionally doesn’t have a lot of political clout. It’s a long way from the Rio Grande Valley to Austin. I wasn’t sure it was going to happen until I got more email yesterday morning. We are supposed to meet the bus at... 4:30 am. 5:05 am – On the road. 7:30 am – Awake now, I think for a good long while. Amazed I was able to get anything close to sleep – these seats are not conducive to it! 7:50 am – Nature Podcast on iPod. 8:15 am – This Week In Science podcast now. 8:50 am – Coming up on San Antonio. 9:03 am – DVD – Ick! I don’t need a Blu-Ray ad – and it’s loud loud loud! 9:07 am – Now a Terminator: Salvation ad. Louder. Then Sherlock Holmes. But volume has finally come down. Still damn hard to listen to TWIS. 9:16 am – I think they’re showing The Hangover. Is Jeffrey Tambor in that? 9:34 am – Ooh, found a much better pen than I’d been writing with. Because I’m actually recording this with pen and paper in the Field Notes book, courtesy of winning a Twitter competition during Science Online 2011. 9:50 am – Starting to see signs of approaching Austin. 10:37 am – HR-221, designating today “UT Pan American Day,” passes in Senate, with many UTPA arriving to visitor galley just as the resolution is being read. 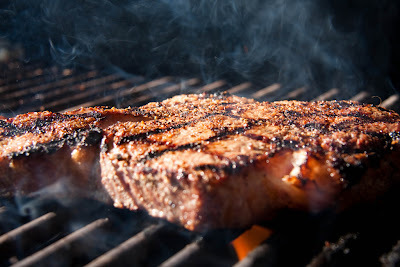 11:00 am – Lunch in the cafeteria grill. During this, I talk to Gail at University Relations about the trip. I am pleased that I am able to come up with a good sound bite. 12:00 pm - Mariachis start playing in the rotunda. People taking pictures and video look happy. The organizers (as they have done and will do all day) look inexplicably nervous, like something could go wrong any second. Other faculty and admin arrive mysteriously. Did they get a better secret bus than me, hanging out with the students? 1:00 pm – Group photo on the legislature steps. President Nelsen says people, like the Navy, have bugged him about UTPA not having a football team, but Nelsen said that the mariachis were better ambassadors than a football team. He also said a football team would happen if someone had a spare $50 million lying around. “Being a university president is like being in a cemetery. You have all these people under you, but none of them do a damn thing. While waiting, I have this incredible geeky desire to go find the stature of Steven F. Austin on the lawn of the capital grounds... because it’s where the type specimen of the field cricket Gryllus texensis was collected. Eventually, everyone is there. Some photographs are shot. Then we break up into teams with info and gift bags to take to representatives and senators. Our team visits 15 offices. None of the elected officials are in. In a couple of cases, we do meet with higher education specialists who are policy advisors to the politicians. This is probably better than seeing the elected officials, in some ways, since the policy people are the ones who think about this stuff all the time. Got into office of a rep from Brazoria County, and told the staff that they should be proud that their county is the home to the largest number of crayfish species in Texas. Also got to see the coolest office in the Texas capital. Representative Hartnett has a 4th floor office with a huge balcony overseeing all of north Austin. And it was a perfect, beautiful day, and they let us sit outside and enjoy the view while we chatted a bit. Most intimidating office was that of the senator that featured a picture of him with the leopard he hunted and shot draped over his shoulders, the stuff cat mounted on his wall as a trophy, and two revolvers and a derringer mounted in a shadowbox frame. A lot of the staff had heard the mariachis, especially the representative staff, whose offices were closer to the rotunda. They wouldn’t have heard a visiting football team. 3:10 pm – Tour of the capital with Nick. He looked a bit tired, but he had a great voice and knew his stuff, pointing out little details like 8 pound custom brass hinges on the legislature doors. Very good! 4:20 pm – President Nelsen talks to students, thanking them for their efforts in promoting the university today. And we get rally T-shirts! 4:48 pm – Ugh. More DVD previews. And they’re not finishing The Hangover from the morning. 5:02 pm – What is this movie? Some football thing. 5:03 pm – Ah. The Blind Side with Sandra Bullock. iPod it is, then. 5:19 pm – Crumb! They’ve got the air conditioning way up. Putting a jacket on. 5:40 pm – Stopping at Luby’s Cafeteria for dinner. Not my favourite. 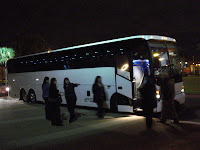 6:00 pm – With two busloads of people, I still haven’t reached the start of the buffet to get food. 6:08 pm – Their blackened chicken is pretty good, actually. Pleasant surprise. 6:58 pm – Back on the bus. They’re starting a movie again. Except they’re back to The Hangover to finish it from... what, 8 hours ago? 7:13 pm – Typing today’s notes into my netbook. Have to put myself into strange contortions to do so, because to use the seat trays they have on this bus, you would have to have a waistline that a corseted Victoria woman would envy. I can’t lay the tray flat without it digging several inches into my body. 7:55 pm - Now the bus screens are showing something by Paul Haggis - Crash? While I might want to see it, I don’t want to see it on a bus. Back to reading Ricky Jay feature on con men and women in Wired. 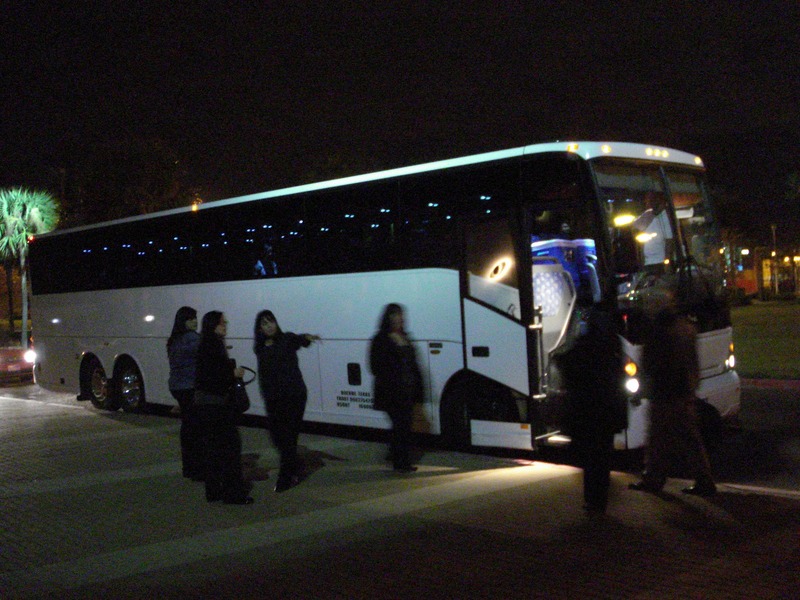 9:28 pm - When I look out the window of the bus, it is often pitch black. No oncoming vehicles, lights, nothing. Slightly unreal and eerie. 9:35 pm - Hoping they do not start another movie after this one. 9:42 pm - Video screens are off! Uninterrupted viewing of The Middleman episodes on my iPod begins. 11:32 pm - Back on campus almost exactly on time; schedule had said 11:30 pm. Time to walk back to the apartment. Friday, 28 January, 12:0something am: At long last, bed. 10:36 am - Still feeling a little woozy from having yesterday’s lack of sleep. Additional: Our University Relations coverage of the event is here, with my sound bites. The Zen of Presentations, Part 37: What makes a good speaker? When I teach a seminar class, I start off by asking the students to name a speaker they have seen who gave a great presentation, and describe what made it memorable. As they go, I write down the things they mention as why this presentation was so good. Feeling like the speaker was talking to you specifically. What I find interesting is that people are so reluctant to do the things as a speaker that they themselves just told me that they enjoy as an audience member. Humour is the most obvious example. My students consistently bring it up as something good speakers do. But I’ve sat through an uncounted number of student talks without any hint of an attempt at humour. I suppose that the reason people don’t do these things is that underlying many of the concepts on that list are risk and hard work. You take a risk when you tell a joke. People might not laugh. You take a risk when you try to get people to empathize. You have to expose what you think and feel. And there are no short cuts to mastering the material or establishing credibility. 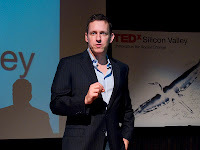 This time, a few specific talks got mentioned, including Randy Pausch’s The Last Lecture and Neil deGrasse Tyson’s conversation with Richard Dawkins on The Poetry of Science (not really a presentation in the usual sense). One person mentioned Isabelle Allende. You can see her here on TED, though I don’t think this was the particular talk the student had seen. Garr Reynolds comments on her talk here. So it’s getting easier and easier for these best presentations to spread now that online video is finally ubiquitous. Still, many people mentioned people they knew personally; preachers or pastors came up several times this session. Good presenters are everywhere, and don’t need a million hits on YouTube to make an impression and make a difference. Who benefits from a bursting bubble in education? He is in no way the first to make this claim. As someone in higher education myself, I absolutely agree that university is not and should not be for everyone. I’ve seen people who didn’t benefit economically from going to university. But I had this paranoid thought. Here is a billionaire (if his Wikipedia entry can be believed). Regardless, he’s not just “well off”; he’s rich. Widely available, affordable higher education has traditionally been seen as a great social and economic equalizer. Our own institution has been credited with helping to create a middle class in a region that was traditionally poor. Ergo, who benefits by trying to convince people not to go to university? The people who are already at the top: the rich and wealthy and connected. People like Peter Thiel. (T)he “war on science” is only the most blatant, surface manifestation of a general campaign against all of our professional castes. Name one that isn’t under fire from the new-right! Scientists, teachers, university professors, attorneys, civil servants, diplomats, journalists... heck even cops! And yes, if you have watched carefully, or know anything about the “miracle of 2006” – even the brilliant men and women of the United States Military Officer Corps have been under assault, for years. Why? Why has such a broad campaign to discredit (almost) every highly skilled and educated expert class become the centerpiece of conservatism? A hijacked version of conservatism that has Barry Goldwater spinning in his grave? You have only to look at the few centers of elite expertise that have been left alone! Those that are spared this all-out onslaught. The financial industry, industry lobbyist associations, and the hyper-rich. Thiel also argues, “we don’t know what people learn.” There is an element of truth to the latter, and universities could do better in this regard. Photo by Suzie Katz on Flickr; used under a Creative Commons license. Hat tip to Hannah Waters. Can a champion team beat a team of champions? Jonah Lehrer argues that teams, not single individuals, are driving scientific discovery. I’m most convinced by an alternative explanation, which is that our modern problems have gotten so hard – so damn intractable, complicated and multi-disciplinary – that we can no longer solve them by ourselves. He supports this with several pieces of evidence, but I think many of them can be explained in other ways. The first piece of evidence suggesting that the difficulty of problems is increasing comes from historiometric data on the “peak age of creativity.” It turns out that the peak age has been getting older for the past several hundred years. Dean Simonton, for instance, has shown that while Leonardo Da Vinci might have benefited from tackling the problems of medieval science in his mid-20s, the ideal age for modern scientists is closer to 40. Why? Because it takes longer to learn the field, to know enough to create new knowledge. Alternate hypothesis: Post-doc glut. Training has extended in part because there has been an oversupply of beginning scientists. Training has lengthened out because of that, and it takes longer to get a job in science. Alternate hypothesis: Equipment is expensive. Not every researcher can have her own Large Hadron Collider. This problem of running the experiment to get the data forces collaborations and teams to form, not necessarily the intellectual difficulty of the problem. (T)he best research now emerges from groups. It doesn’t matter if the researchers are studying particle physics or human genetics: science papers produced by multiple authors receive more than twice as many citations as those authored by individuals. Alternate hypothesis: Self citation, self promotion, networking. A dozen authors can promote a paper in a way that a single author cannot. And as we all know, nobody promotes your work like you do. Drawing on my search committee experiences, here are more tips for tenure-track job applicants! One of the first things people are going to do is count your publications. Don’t hide that number. Don’t put the publications five pages back in the CV; put them as close to the front as possible. 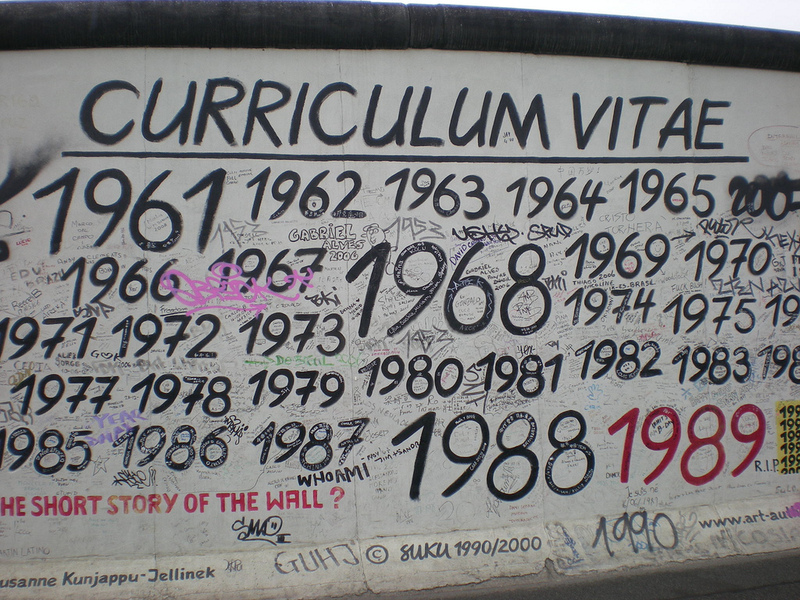 Never do anything that might be seen as trying to inflate your CV, particularly publications. For instance, clearly distinguish manuscripts “in preparation” and everything else. Everyone has projects that just never find a home, so “in prep” isn’t true proof of your abilities. If people think at first you have ten publications, then realize three are in preparation, they’ll feel you’re misled them. Under promise and over deliver. Don’t use non-standard phrases like “Selected publications.” What does “Selected publications” mean? What was the selection criteria? How many more were not selected? It looks like a diversionary tactic. Embed clickable links to your papers in it. If it’s submitted electronically, that means it is probably going to be distributed to the committee electronically, and committee members will read them on their desktops with a live internet connection. Make it easy for someone to click through if they’re curious. Make one PDF with everything in it. Don’t divide them up into one for your cover latter, one for your CV, one for your research statement, one for your teaching statement. Otherwise, people have to be opening and closing files over and over, which (to me) is more annoying that scrolling or jumping a few pages. The Courier typeface is a bad choice for a CV. Photo by yelacis on Flickr; used under a Creative Commons licence. In the UK, the BBC Two show Horizon had a show on called, “Science Under Attack.” Judging from the response of the Free Radicals blog, it showed why science is under attack in ways that they probably didn’t intend. Luckily, there are other white-haired white male scientists to share the pain of not being understood. Phil Jones, for instance, the man who refused to deal with a co-ordinated set of Freedom of Information requests from climate deniers (designed as a bureaucratic Denial of Service attack) and set the whole climategate scandal in motion. “I wish people would read the peer-reviewed literature,” Jones sighs. No, really, he said that. Out of touch with the general public? Us? My jaw may have dropped when I read that. People are busy! They have jobs, bills, small and large children, pets, hobbies... and you’re seriously asking them to read some of the technical and specialized writing in the world on the newest research findings on journals that are so expensive that only large universities cough up their subscription fees? There is a reason that science became a specialized profession. People are expecting us scientists to read primary literature so they don’t have to. If you were asked to provide an example of what “ivory tower” means, you couldn’t find a much better example than that quote. And that is one reason why science is under attack. This one is for the professionals in the audience. 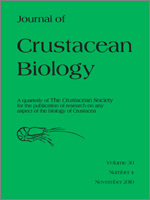 I just received an email from Fred Schram, the editor of The Journal of Crustacean Biology (JCB). It was a classic “good news / bad news” scenario. Submissions to JCB are up; we have a wider array of authors from an increasing number of countries across the globe; we are recording increasing number of hits in BioOne to JCB articles as evidenced by a rise in income from BioOne and JSTOR; our impact factor is rising. In other words, people are using JCB! However, while we continue to move JCB into the digital age, our membership in The Crustacean Society (TCS) has been slipping away. Sad to say, in 2010, for the first time TCS ran a deficit. There appears to be a curious disconnect. Because of the internet, use and access to the JCB are up. But people do not seem to realize that if we do not have enough TCS members, there will not be a journal. Sometimes people ask what they get from scientific societies. High quality journals at a reasonable price compared to for profit publishers is a major one. If you do research with crustaceans, consider joining the Society! 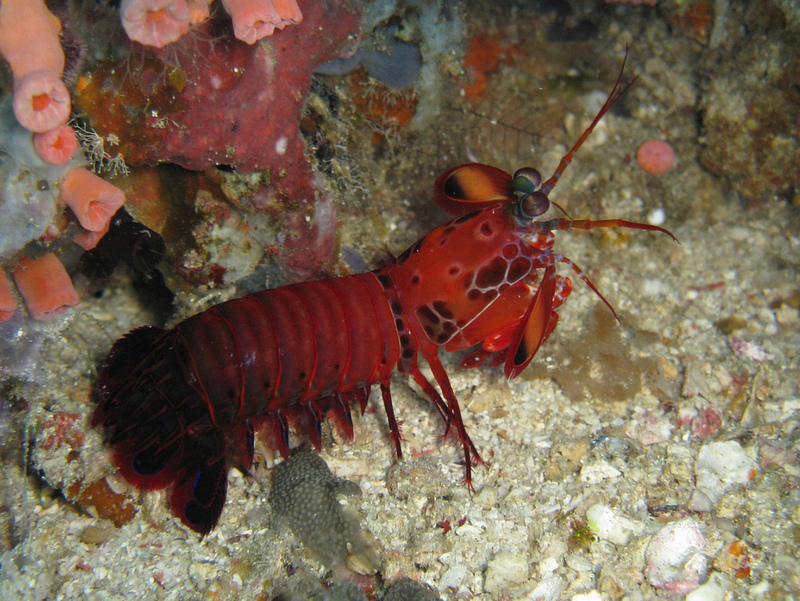 Full disclosure: I am a member of The Crustacean Society, have published, and have a paper in press in, The Journal of Crustacean Biology. 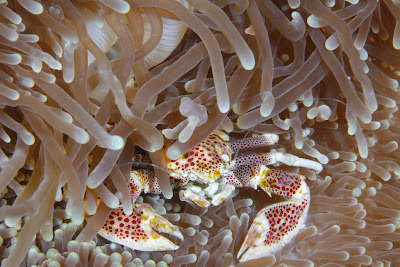 A member of family Porcellanidae, hiding out in anemone tentacles. Species unknown (to me, anyway). Photo by PacificKlaus on Flickr, used under a Creative Commons license. On Friday, I wrote about a documentary on the Texas State Board of Education that was looking to hire an editor. They put the project on Kickstarter, and on Friday, they were just a little more than halfway there. Not only did this project makes its funding goal in very short order, it is surpassing it by a wide margin! The producer has said the surplus will be going to hiring a composer, so there is more to come. So if you’ve got a dollar or two, you can still support this project. You could be forgiven for thinking that there’s no way you could get a useful brain scan of a fish. First all, if you pay attention to brain scanning, you have probably heard a story about fish in fMRI machines that has become the stuff of scientific legend. The salmon in question being scanned for brain activity was deceased. Pushing up daisies. Size feet under. Joined the choir invisible. In a word, dead. Yet a brain scan revealed statistically significant brain activity. Bennett and colleagues were making a point that simple statistics on brain scans could be misleading. But they may have inadvertently dampened other salmon related scanning studies. Brain scans are increasingly being used on small animals. Here, brain scanning gets turned towards studying one of the oldest and deepest questions about salmon behaviour: their ability to return home. Salmon, like sockeye salmon (Oncorhynchus nerka), are hatched in freshwater streams. From there, they swim out to the ocean, spend years growing and growing, then swim back to the same watershed they were hatched in. That ability to find that original stream, out of the hundreds or thousands pouring into the oceans baffled people for a long time. Given the complexity of the task, there is probably going to be no single explanation for the salmon’s homing ability, but it seems like smell is playing a large role. There is both behavioural and physiological evidence supporting this. It’s difficult to build up a cohesive picture of brain activity associated with something like smelling with traditional electrophysiology. You can only record a few cells in a brain at a time. This is where fMRI can shines: looking at the big picture. You would predict would that the salmon’s brain would show some responses that would occur to pretty much any odour, and a different response to water from the stream a salmon was reared in when it was young. The stream water contains amino acids, too, but at concentrations about 20,000 times lower than the amino acid solution used as a control. The experimenters gave the fish fresh water for 10 minutes, an odour for 10 minutes – either the stream water or water laced with amino acids – and then back to non-smelly fresh water for 10 minutes. The two fluids caused very similar brain activation in the olfactory bulb, which is is basically one step from the nose. If anything, the amino acids activate the bulb more strongly than the stream water. But things started to differ as the signal went deeper into the brain, through more steps of processing. When you got into the main part of the brain, the telencephalon, the stream water caused some areas of the brain to activate that the amino acids didn’t. And those regions that were activated by both, the response was stronger to stream water than the amino acid mix. There are all sorts of interesting questions you could ask with these methods. Could you show that fish that get lost and don’t make it back to their home stream show a weaker signal than those that do? Could you show migrating species have this signal but not non-migrating species? While these could be answered with other techniques, it seems that fMRI might be able to do it a bit more efficiently. Bennett C. 2009. The story behind the Atlantic salmon. http://prefrontal.org/blog/2009/09/the-story-behind-the-atlantic-salmon/. Bennett CM, Baird AA, Miller MB, Wolford GL. 2008. Neural correlates of interspecies perspective taking in the post-mortem Atlantic Salmon: An argument for multiple comparisons correction. 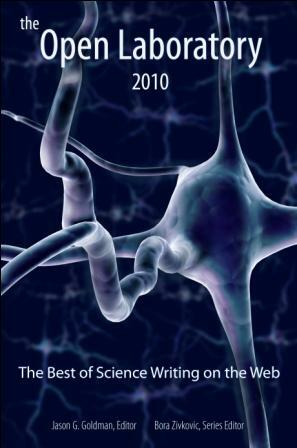 Human Brain Mapping 2009. San Francisco. Salmon picture by toddraden on Flickr; steak picture by Another Pint Please... on Flickr; both used under a Creative Commons license. 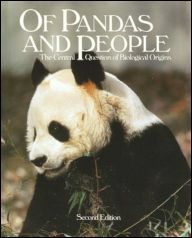 Of Pandas and People? Not so much. The Texas Freedom Network is reporting that Foundation for Thought and Ethics, the publishers of the intelligent design textbook Of Pandas and People, plan to submit materials for possible use in Texas K-12 schools. The press release notes that reviewers are being appointed to check all submitted materials for meeting the Texas standards, and for accuracy. It may be a moot point, however, given that there are recurring questions about whether Texas will purchase any school textbooks in the next while due to budget shortfalls. In a sense, this is good news. 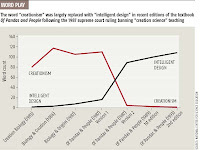 The Kitzmiller v. Dover trial showed that this company had hastily revised the draft Of Pandas and People when it was ruled in court that teaching creationism was illegal. Drafts of the book showed that the word “creation” and all variations of it were prominent in early drafts (click to enlarge graph at right). 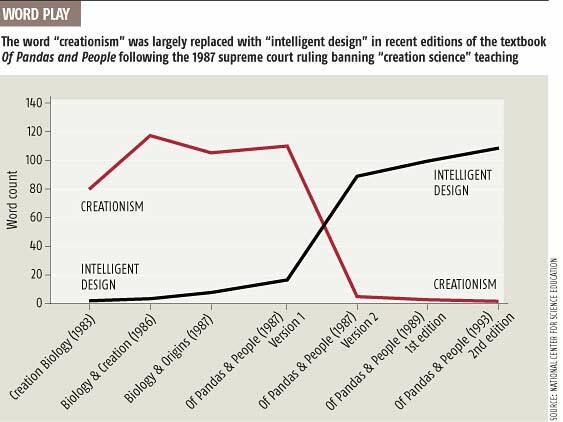 After a U.S. Supreme Court ruling against “creation science” (Edwards v. Aguillard), the word almost entirely vanished. It made it almost impossible for those attacking evolution to claim that intelligent design was anything other than creationism renamed. In related news, Orlando Wood is looking for help. He is making a documentary about the adoption of the Texas State Board of Education and their adoption of K-12 teaching standards. He is attempting to raise $10,000 to hire an editor for the film. He’s more than halfway towards that goal. And before you ask: Yes, I donated. I donated for the same reason I have been blogging about this story continually for the last few years: documentation is good. Indeed, one good thing about this process is that it has generally been transparent. 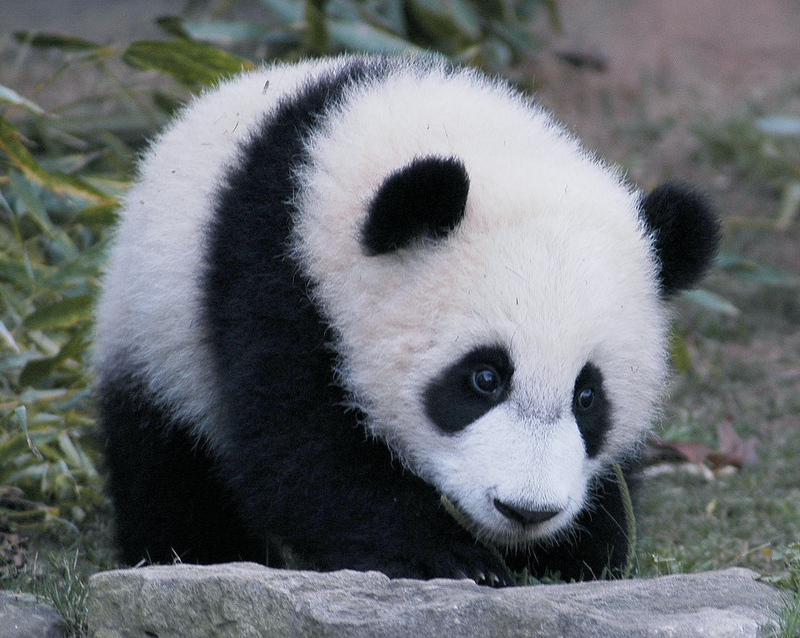 Panda photo by ucumari on Flickr; used under a Creative Commons license. This is my blogging buddy (and fellow crayfish mafioso!) Carin Bondar. She’s been making a series of short videos called Biomusings. She also did a short film that won an award for the Canadian Discovery Channel’s “Film Snacks” competition. Part of the reason they’re so good is that Carin’s personality comes through the screen, like it does in the picture here. And there’s also that Carin is beautiful. I was going to say “photogenic,” but let’s not mince words. It’s obvious. When I showed Carin’s web site to one of my students, she immediately said, “Awwww, she’s really pretty.” And that helps in video; it’s a visual medium. I enjoy Carin’s blog, but I am willing to bet that she will have more success with her videos. Previously, I argued that the pursuit of likeability and media savoir faire was often at odds with authenticity. 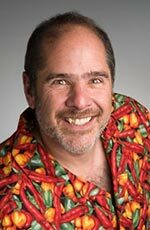 In his latest edition of The Benshi, Randy Olson grapples with this question. I think there is a way to cut this Gordian knot. A wonderful thing about science communication today is that there are more than 31 flavours. There is more than enough room for people to specialize. Some people will be brilliant storytellers. Some will nail television interviews. And some... well, some people should just let others talk about their work. Me? I probably wouldn’t be very good on screen. I won’t cut my hair. I won’t wear a tie. I have a great face for radio, as the old joke goes. But despite using that old joke, I haven’t yet figured out how to do radio right. I was on radio a couple of times last year. I was okay, but on reflection, I could have done better. On the other hand, I’m pretty happy with my writing. When I’m on the ball, I can give a good presentation. So I’ll let Carin and Joanne do the videos that they’re so good at. I’ll try to find my own way, and to carve out my own niche in science communication. Find what you are, and be that. 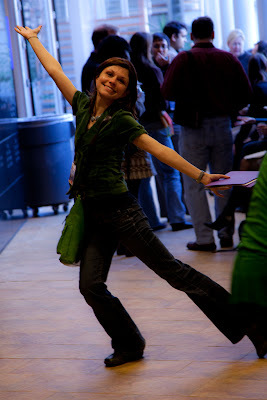 Picture of Dr. Bondar by Lou FCD on Flickr; used under a Creative Commons license. I can sum up in two words what it is that is asked of you, and really, everyone who works in science: Astonish us. That’s it. Something about that advice niggled in the back of my head, bothering me. The more I thought about it, the more it bothered me. 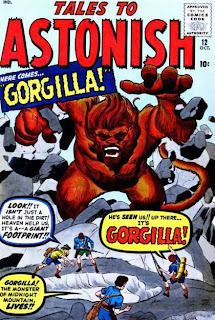 What is astonishing? The surprising, the unexpected, the dramatic. There’s nothing wrong with wanting to do that kind of science. I love me a good breakthrough. We’re already highly biased towards those kinds of stories. It’s easy to get carried away. For instance, saying that bacteria can live without phosphorus is an astonishing claim. * Saying that vaccines can cause autism is an astonishing claim. Saying that the third Monday of January is the most depressing day of the year is an astonishing claim. Likewise, focusing on astonishment plays into the belief that science is just for geniuses. Part of astonishment is the feeling that “I never could have thought of that!” I’ve always hated, “What would [insert name of terribly clever person] do?” That never helps, because I am never going to have the same working knowledge and experience as that person. This craving for astonishment feeds into the mindset that if it isn’t amazing enough to get into Science, Nature, or Cell, it isn’t worth doing. So entire foundational fields, like basic taxonomy, suffer because describing a new species of beetle isn’t astonishing. It doesn’t surprise me that Green is addressing people who do biomedical research. The entire culture and attitude of biomedical research in the United States is largely driven by the funding practices of the National Institutes of Health. And the NIH funds individual projects in increments of a few years. In other agencies in other places, there’s more of an emphasis on supporting the careers of individual researchers. This used to be true of Canada’s Natural Sciences and Engineering Research Council, though I’m not sure if that is still true. I hope it is. Focusing on the astonishing undervalues incremental progress. It undervalues hard work. It undervalues the long view. * This case is different from the others I cite in that it is still being worked out, scientifically, and may yet prove to be correct. But it was a story that had “legs” because it was astonishing. Last week, I weighed the pros and cons of two different academic referencing styles: (Author Year) versus 1-3. I argued that the (Author Year) format was increasingly useful the more embedded a reader was in a research field. But I was focused on the names, and whether a reader could identify the authors. It occurred to me that even for a completely uninitiated reader, the year is potentially useful information. A claim that is supported by a reference from 1930 means something different than a claim supported by a reference from 2010. Whether that difference is good or bad is hard to say. Readers could be be biased by knowing the year of research immediately. 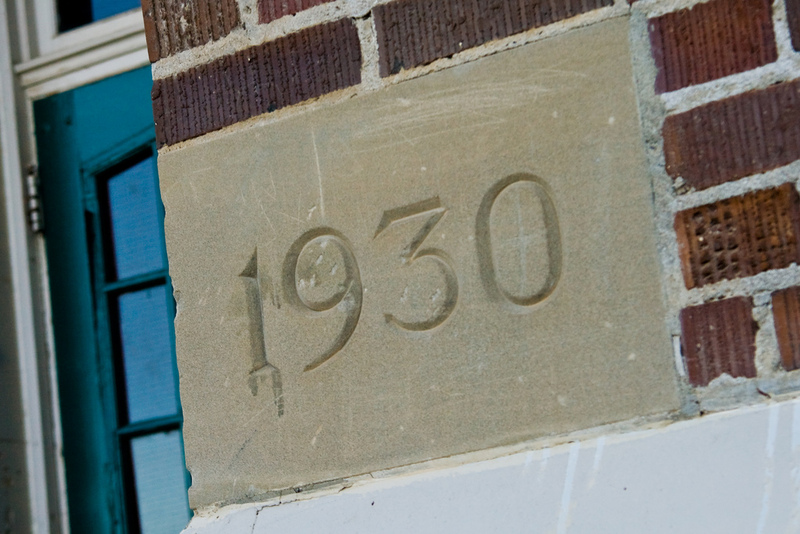 Some might automatically discount older references as out of date or obsolete, when the science might have stood the test of time and be completely accurate. Photo by Cuppojoe on Flickr; used under a Creative Commons licence. The talk I planned to give this weekend is postponed. One of the problems with doing the Tuesday Crustie features is that it often makes me feel incredibly ignorant. I can’t even hazard a guess at what genus this animal is in. 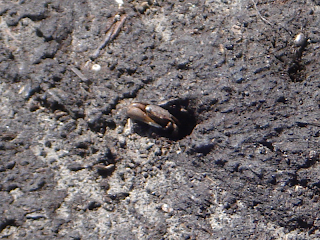 It’s a brachyuran crab, but that’s as much as I know. But it’s so cool looking, I can’t resist including it. Photo by Ezio Armando on Flickr; used under a Creative Commons license. Heroes have to be relevant. Sometimes, that means they have to reinvent themselves. Frank Millar gave the caped crusader his balls back and made Batman relevant again in 1986. Russel T Davies wrote epic, emotional rollercoaster stories, and made The Doctor relevant again in 2005. J.J. Abrams, Roberto Orci and Alex Kurtzman rediscovered character and made the crew of the U.S.S. Enterprise more relevant than they’d been in a long time in 2009. Warren Spector is trying to make a a character who turned into a corporate logo relevant again... in a Wii game. And has come closer than anyone might have reason to expect. It doesn’t always work. Sometimes, heroes are too tied to a time, or some particular vision, to become relevant again. An aimless, gutless mini-series couldn’t make No. 6 relevant again in 2009. Nobody has been able to put the lightning back in the bottle that made Captain Marvel more popular and relevant than Superman once. Seth Rogan, Evan Goldberg and Michel Gondry are trying to make The Green Hornet relevant again with the release of the new movie this weekend. I wonder if anyone can anyone make Charlie Chan relevant again. I’m not very familiar with the character of Charlie Chan myself, but the detective is featured in one of the cases for the 2011 Ethics Bowl National Championships. 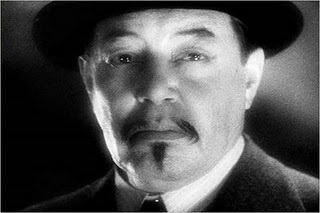 Some people got offended by a screening of a Charlie Chan documentary last year, and argued that Chan’s character perpetuates Chinese stereotypes. Plus, Chan was usually played by white actors, the first being Warner Oland (pictured). On the other hand... Charlie Chan was intelligent. He caught the bad guys. He was a hero – and he was a hero at a time when heroes who were anything other than white were in short supply. But he’s a hero with “baggage,” as they say, given how people are about ethnic sensitivity. I suspect the writers of The Green Hornet had similar issues with Kato. It’s not cool for rich white guys to have servants any more, particularly one who isn’t white. Anyone trying to make The Lone Ranger relevant again will have similar problems because of Tonto. I wonder what is it that sets apart the characters that people are able to reinvent and make afresh every few years, versus those who have their time in the sun, but are never quite able to come back into public consciousness. And which category Chan falls into. Because, as I’ve said before, there are few things more satisfying than heroes who haven’t lost it. That’s me according to Kevin Haw’s AD&D Stats quiz. Picture by sdobie on Flickr; used under a Creative Commons license. I don’t think it will, at least not in the sense that its most progressive advocates envision. And right away, there’s the problem: “open science” means different things to different people. I bet some people equate it with open access publishing – that’s part of it, but that’s not all of it. What some people mean by open science is that they want to see raw data being uploaded and publicly available as it is generated. You might call this the Big Brother approach to science: absolute transparency and complete documentation of the process, not just the end result. I don’t think that degree of openness will become the norm, for the same reasons that I don’t want to watch the “making of” a movie before I see the movie. The product should be more important than the process. Besides, both in science and filmmaking, so much of the process is boring and tedious. I like DVD extras, but there’s a difference between just throwing in any random stuff to fill out the DVD and well-made documentaries. Second, there are a lot of incentives and reasons for people not to open up. Some of them are even good reasons. The currency of academics are completed journal articles and books. Not manuscripts, not datasets. And I think that is good in that it encourages projects to move to more logical completion points, rather than sketches and half-baked ideas. “Astonishment” is a near synonym for “surprise.” And you can’t surprise people when they’ve watched the whole thing unfold in front of them. If you’ve been actively blogging and tweeting and posting data on a project, you can’t build that anticipation, or give someone the satisfaction of going through a completed story. Alfred Hitchcock once said, “Drama is life with the dull bits cut out.” There’s something to be said for scientific articles and proposals to be science with the dull bits cut out. Finally, you have to remember: This is academia we’re talking about. This is a world where the primary means of teaching is still the lecture, for God’s sake! 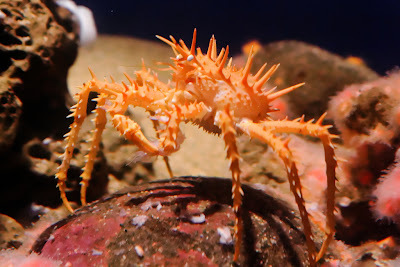 Many scientists are still mightily resistant to the whole idea of science blogging - which is naught but the tiniest of tiny cracks in opening up science. Within the few months, we had NASA and Felisa Wolfe-Simon saying, “Discussion about our paper on arsenic-tolerant bacteria must occur in the pages of peer-reviewed journals” (and who subsequently boasted of engagement after putting up one PDF before resuming radio silence); we had an editor telling bloggers that why a paper was retracted was “None of your damn business”; a scientist being told by colleagues that he shouldn’t have been blogging for the Society for Neuroscience; and editorials casting doubt on the trustworthyness of bloggers. We who are online would like to think these are strange aberrant comments by laggards and luddites. They are not. They are the mainstream. How many other faculty do I know at my university who are actively blogging and doing other social networking stuff? Zero. I admit I don’t know all of what’s going on in other departments, but within my own department, there is me, and one of my colleagues is on Twitter. A couple maintain their own webpages. Nobody else blogs that I know of – at least, not about science. Culture is an insidious thing. We often become more like our intellectual parents than we’d often care to admit. But I am not entirely cynical about this. Some people see open science as a sudden releasing of floodgates. 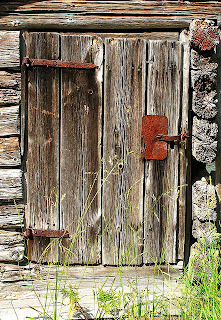 I see it more like an old door. The locks aren’t much of a deterrent, and the door is slowly being pushed open on rusty hinges. Science will become more open, but like the process of much science itself, it will be in tiny little steps. Photo by visulogik on Flickr; used under a Creative Commons license. At Code for Life, Grant Jacobs disagrees with me, which I always love. From disagreement comes learning, from learning comes improvement, from improvement comes awesome. A belated comment on Gerty Z’s blog about why tenure guidelines are often vague. Not a comment, but a pointer that something I wrote appeared on Out of Context Science. Mike Taylor, writing at SV-POW! doesn’t like numbered references. Scicurious and I share something: We both have a post in Open Lab 2010 that came not from our own blogs, but from the Scientific American Guest Blog. For one blog to have two entries in Open Lab is no mean feat, and it’s a testament to the fine work of the one who commissions and edits the Guest Blog, Bora Zivcovic. They asked for feedback about the logo, so I sent an email, which got read on this week’s podcast (starts at 23:26). Several other listeners responded much more to the source of the suggestion than the logo itself, methinks. I think the grays help make the top one a bit more edgy, like street art; the bright colours on the bottom one look a little too cartoony. Open Lab 2010 cover: Dude, where’s my Comic Sans? 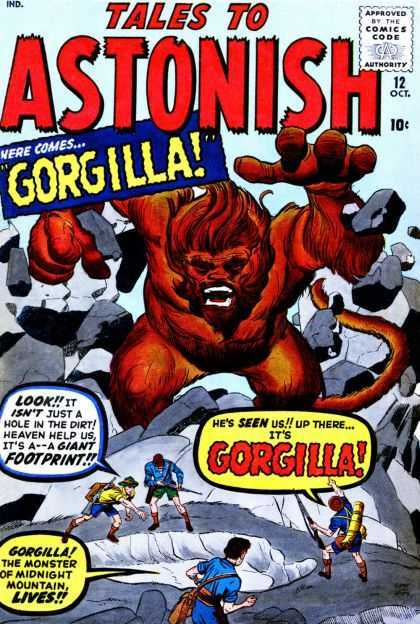 Andrea Kuszewski and Jason Goldman both were tantalizing that there would be Comics Sans on the cover. But nooooOOOOooo... the big fibbers. Unveiled at A Blog Around the Clock. South Padre Island Birding and Nature Center: free talk! 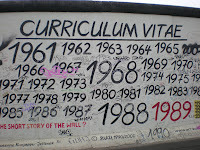 Update, 18 January 2011: This talk is postponed until a later date. I am scheduled to give a talk at the South Padre Island Birding and Nature Center next Saturday, 22 January 2010 at 10:00 am. It’s not up yet on their calendar of events, but this is the first of a series that will be running over the next few weeks in February and early March. The presentation will be free, non-technical, and hopefully a lot of fun for all. Please come and join me! But is it practical? What if you came up against someone with, I dunno, a longbow and you had to run? Things could be worse, though. At least that sword can be dropped. If you’re Xiphophorus helleri, you’re not so lucky: you’re stuck with your sword. 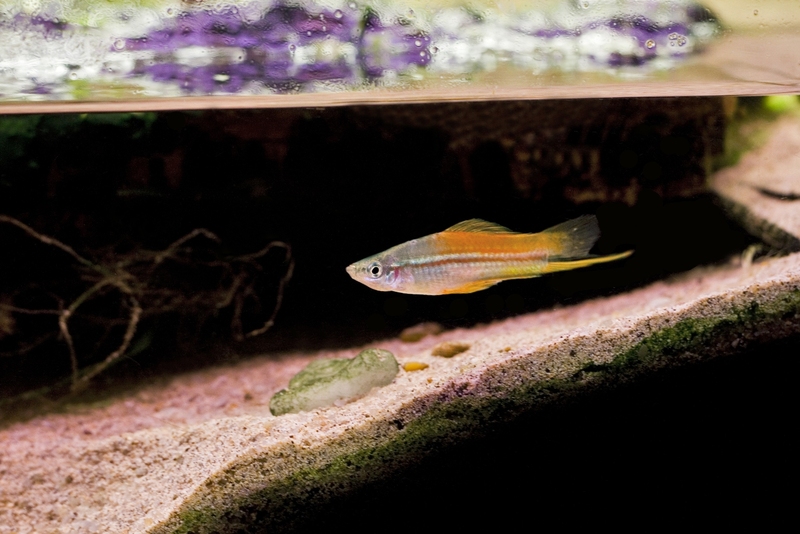 Consequently, the role of swords in swordtail courting and mate selection has been well studied. But Baumgarter and colleagues are more interested in what the sword is doing all the rest of the time when a male isn’t trying to catch the eye of fa female. That long sword could impose a cost on the fish. It might make it harder to swim, particularly when time is of the essence. Swordfish, like many other fish, will escape from a sudden stimulus by bending into a C shape that pulls the head away from the source of the stimulus before the animal swims off. I’ve talked a little about C-starts before (here and here). Baumgarter and company tested the C-start performance of males with a range of sword lengths, and found no significant differences in their behaviour. They also did before and after experiments where they removed the sword from the tails, and again found no differences in the before and after abilities of the fish to perform C-starts. 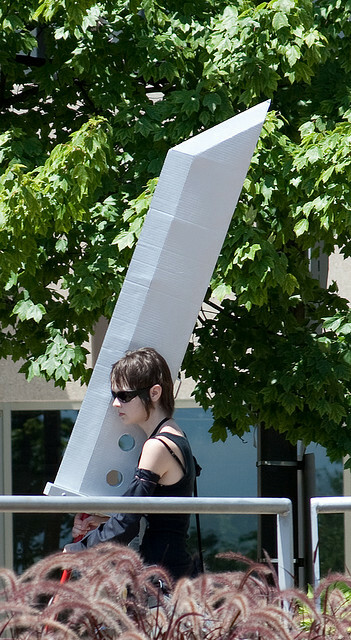 That the sword doesn’t impact on this particular behaviour doesn’t mean it’s “free,” though. Those long tailed individuals may have to perform those C-starts a lot more, as the authors note that it’s entirely possible those big, showy tails could translate into more predator attacks. C-starts are explosive and typically executed in high-risk situations – but they’re rare. Steady swimming is the norm, and the researchers note that long swords seem to make steady swimming more tiring, turning the sword into an ongoing energy sink. Sword picture by DJOtaku on Flickr. Fish picture by mineobskuriteter on Flickr. Both used under a Creative Commons license. Carnival of Evolution #31 is hosted this month at Dispersal of Darwin. Carnival of the Blue #44 is at Beach Chair Scientist. Circus of the Spineless is supposed to be up at Cephalove... but nothing yet. Mike? Mike! Additional: Circus of the Spineless #58 is now live! Academic writing is set apart from almost all other writing by its obsession with citations. Mike Taylor hates numbered references. He notes that numbered referencing saves space in print journals journals where space is at a premium. For journals on the web, there are no space constraints, and thus no reason to use numbered references. I want to dig down into reference styles a little. I think I can show why professional scientists are more likely to prefer references using author and year (also know as Harvard referencing) than anybody else. The more deeply a scientist specializes, the more he or she can recognize papers by the author and year alone. Another reason professional scientists like the (Author, Year) format is because of the personal branding. If someone cites your paper multiple times, it builds name recognition – particularly if you have a slightly distinctive name in your field. And that can help facilitate networking at conferences and general career development. Writers of scientific journal articles also have reasons to like the (Author, Year) style, because it’s easier to prepare a reference list. If you insert one reference in the middle of a manuscript, all the references after it have to change. That's why I use name and year references in blog posts; they're quick and easy to do by hand. I think this also explains why having the full references at the end of the paper more common than footnotes. I shudder to think of doing footnotes on a typewriter. Nobody doubts that numbered references are shorter that the Harvard style. But the advantage goes beyond saving paper. The original passage is unspeakable and unreadable, but neither the author nor the editor is interested in whether anyone reads the paper. Indeed, they prefer nobody reads beyond the summary, or better still, beyond the authors’ names. I don’t think it’s an accident that most books describing research for a general audience treat references with a light touch. Typically, you’ll find only a list of key references at the end, with very few (Author, Year) intrusions into the text. The more rigorously documented and referenced a work is, the more difficult it is to read. Numbered references are fairer to scientific authors than the (Author, Year) format. The tradition is that if you have three or more authors on a paper, the reference in the test is given by the name of the first author only. If you’re author #2 on a three author paper, you’re screwed. Why should one person get on a large team get such a disproportionate amount of personal advertising by having their name printed throughout the main body of a paper, while the name of author 2 of 3 is only printed once in the literature cited? It’s no coincidence that order of authorship is a common cause of fights and discontent between researchers. More and more papers are being written by larger and large groups of authors, meaning this problem is only going to get worse. As for the ease of preparing a manuscript, this is why specialty reference manager software exists. We are not living in the age of typewriters any more. For online journals, technology should be able to provide a “best of both worlds” solution. It should be possible to have numbered references where you could pull up a complete citation in a little pop-up window by hovering the cursor over the number, similar to clicking the magnifying glass icon next to search results on Google. So the style of referencing actually cuts to a very deep question: Who is a scientific journal article for? One format favours the professionals: the people who are deeply embedded in the literature, and who actively contribute to it. The other favours the readers: those just entering the field and the curious bystanders. “Open science” is not just about who pays for research and reprints and journal subscriptions; it’s about access in the broadest sense. And something as simple as the reference could raise or lower the barrier to someone reading a research paper, even if just by a smidgen. I’d much rather the barrier be a smidgen lower than a smidgen higher. That I wasn’t able to find a copy was a relief. Paradigms. I would have been way out of my depth. Oakley P. 2003. How the name date (Harvard) reference style in papers shows an underlying interpretivist paradigm whilst numeric references show a functional paradigm. Systemist 25: 25-30. Additional: An independent analysis at The Open Source Paleontologist arrives at some similar conclusions. A peacock mantis shrimp (Odontodactylus scyllarus). Personally, I don’t see the resemblance. Photo by danielguip on Flickr, used under a Creative Commons license. Note: The following is a guest post by G. Adrian Horridge. Dr. Horridge is probably best known as co-author of the massive two volume book, Structure and Function in the Nervous System of Invertebrates, published in 1965. Enthusiasm and activity in the young, and scientific investigation by experiment, not to mention the publicity, are all commendable. There are some irrelevant mentions of dogs, human puzzles and helping us to understand ourselves better, that add to the interest but not to the science. Without them, the matter would be boring. However, science is improved when the conclusions agree with the data. We have abundant information about the vision of honeybees, and for the time being must assume that bumblebees are similar. 1. It is impossible to show that bees detect THE pattern, because they may have recognized only a small part of the pattern (a cue), as shown in 1938 by K. S. Lashley for the rat. 2. Honey bees detect cues, not patterns as we do, as shown when trained bees treat as equal a learned pattern and a different pattern that displays the same cues. They recognize the place of the reward by means of landmarks (combinations of cues). 3. Bees can be forced to see blue and yellow apparently at the same time, as shown by Baumgärtner in 1928 with small areas close to the reward hole, but they can do it only if they use one eye for each colour, because colour processing is done by the two eyes separately. Apart from this, bees cannot be trained on two alternative different colours at the same time at the same place, because what they learn on one colour, they unlearn when presented with the other. Internal evidence in the Blackawton paper. The bees were first trained with all the discs white and rewarded. Previous work tells us that if only the central four discs were rewarded at this stage, the bees would locate the reward by triangulation on the outer rows of discs. Whatever is then done to alter the outside edge in the training regime would spoil their piloting towards the centre. They used the outer edges because these were separated by large angles on the eye, making their triangulation more accurate as they approached. The reward was then restricted to the central four discs and the blue and yellow colours were applied. As shown by the test results, the bees did not solve the problem by ignoring the colours and simply going to the centres, as a colour blind person would, so they did not use the simplest solution. Bees prefer blue to yellow inn the learning situation, so they learned to respond to blue when they arrived on the scene. Two bees clearly learned to go to the blue centres, probably using the edges to locate the centre, and I expect they would never have learned anything about yellow. For them, yellow was not rewarded. They accepted green at the centre in Test 2. To locate the position of the reward, two bees learned to avoid the blue at the periphery, and they accepted a yellow centre. For them, yellow was rewarded. These two bees rejected the green at the centre in Test 2. For related data, see figs 11.1 and 11.2 in the book referred to below. Table 1c shows these two classes of bees. For bees O and B/Y the total score was yellow centres 7, blue 54. For bees B/O and B the total was yellow centres 64, blue 1. These two classes persist to some extent in tests 2 and 3; notably bees B/O and B accept green at the centre and yellow in test 3. There were therefore two classes of bees, those that preferred blue at the centres and those that avoided blue at the periphery. All the bees used the position of the periphery as their cue to locate the centre. The bees that used a blue periphery need not have learned the colour at the centre at all; those that simply went to the blue centre triangulated on the edge of the square and expected blue at the reward. To keep the data homogeneous, and to make inferences from it, results from these two classes of bees should have been kept separate. The authors say that the salt was added in the outer ring of discs "so that they would learn to go not just to the colours, but had to learn the pattern". I suspect that they did not learn the pattern, only the cues mentioned above. Both of the possible training patterns were presented, each twice, presumably so that the squares could be interchanged by rotation of the whole. In tests, honey bees have to be refreshed with a short spell of more learning after making a few choices, because they do not persist in making hit after hit without a reward. 1. In test 1, the authors say they allow each forager to make 30 or so choices and each bee was tested three times, total 90 tests, and there were five bees, so was that a total of 450 choices? There is a small discrepancy with the total number of choices in tests 1, 2 and 3, which was 394. 2. Test 2. The trained bees were tested with squares in which the four central discs were green "to see whether the bees learned to go to the colours or the location". The authors say that the bees apparently chose at random. One explanation might be that all the bees piloted by using the periphery and none of them expected to find green at the centre, so they started to relearn the place of the reward by trial and error and appeared to choose at random. However, bees B/O and B that had learned to avoid blue at the periphery still went to the centre, and why should they not? However, bees O and B/Y that had learned to expect blue at the centre now went to the periphery, so the randomness was an artifact of adding the two classes together. The authors inferred that "that the bees did not solve test 1 by only going to the middle flowers", but no explanation was offered, and the bees had indeed solved the original problem by going to the middle flowers, but the authors hinted at something more. 3. In test 3, the central discs were exchanged with discs from the corners of the squares to see if the bees learned to go to the colours that were fewest or still go to the middle flowers. The result was 59 choices at the corners and 86 elsewhere, but we are not told how many chose the edges or the middle, so the test data is not comparable with the training data. Only 25% of the discs are at corners, but 40.1% of 145 choices were to corners, so there was probably a preference for corners. The individual preferences for or against blue can still be seen. However, the authors "think that the bees in test 3 selected the flowers randomly". This leads the authors to conclude "that in test 2 they must have used the larger square of blue and yellow flowers to decide to forage from the middle green flowers" even though they had previously found that choices in test 2 were random. Did the bees in test 2 forage from the middle green flowers or at random? Where did the authors get the idea that they used the outer square? Test 2 shows that two bees, B/O and B, had not learned the colour at the centre at all. Test 3 is easily understood if all the bees piloted by use of the peripheral edges, so when these were dislocated in any way the bees started to relearn the place of the reward by trial and error, retaining some of their preference for or against blue. Totaling the score made them appear to choose at random. The authors say that the bees had to learn to go to one colour (blue) if it was surrounded by the opposite colour (yellow) but also to go to yellow if surrounded by blue. The observed preferences of the bees show that two bees solve one pattern and two other bees solve the other. In each test, two of the bees became confused about the place of the reward because their expectations about either the centre or the edge were not fulfilled. Apparently the authors thought that the bees see the coloured patterns and the experiment was designed to discover how the bees solved the puzzle caused by the two different arrangements of the colours. So, the experimental design was based on a human vision of the task, but the bees had a different idea about how to solve the problem, by learning only one pattern. Humans are few and have big brains that solve simultaneous tasks, but bees are very numerous and have small brains, so they take one task at a time. When targets are fixed, and landing on the rewarded place is the criterion of success, it is very difficult to discover how bees locate the reward, because when they arrive they bring a memory of what they expect. Therefore any experimental change to the targets makes the bees start to learn afresh by trial and error, or go away. This general topic is not new. In the last decades of the 19th century, Professor Felix Plateau (1841-1911) of Ghent, Belgium, published many papers on how bees find flowers. He hid real flowers with paper but the bees went under the paper, so he concluded that the shape and colour were not the chief relevant features. He also tried to attract the bees with carefully painted paper flowers, but the bees ignored them. Plateau concluded that bees recognized flowers by their odour, although others had shown that the bees did not need the odour. Professor Auguste Forel (1848-1931) of Zürich, produced 50 pages of objections, supported by Plateau's own data. He accepted Plateau's data but not the false conclusions. He repeated the experiments and concluded that the flower shapes and their colours were not relevant but the bees went to the rewarded place with the help of landmarks that he could not define. He says (in translation) 'In using the experiments of M. Plateau himself to show the errors of judgement that he draws from them, I fully render homage to his scientific honesty. It is precisely this honesty which has allowed us to follow the author step by step, and to pick up, by the help of his faithful narration of facts, how the facts relate to each other and that they are mutually consistent. Thanks to this, our study will not have been a sterile polemic, for it has brought us to see more and more clearly into the very question which occupies us.' The question was how to design suitable experiments. G. Adrian Horridge, FAA, FRS. Holy cow, I’m in Open Lab 2010!